Since our last blog a lot has happened, locally, nationally and within Ceramic Substrates and it is sad that nationally the news has been extremely troublesome and concerning for many. Here at Ceramic Substrates our thoughts are with all the people that have been affected during this difficult time and we hope we can all live without fear. Our recruitment drive has continued through June and we are pleased to announce that another new member has joined our Team to work a long side Sean our Production Manager. “Peter” has a wealth of past experience of working within a factory environment. He has worked for a major automotive company and has experience of working on moulding machines, drilling machines and hand fettling. He has a background of working within quality control, using hand held and dedicated measuring equipment. Here at Ceramic Substrates looking after and protecting our Environment is of high importance and re-use and recycling is always on our agenda. However, as a manufacturing business there is always waste that has to be collected and dealt with by Professionals who have specialised equipment to transport it for treatment. 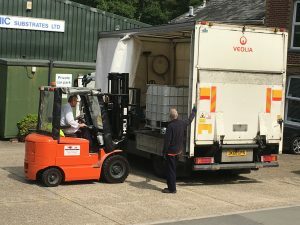 In the picture below you can see one of our IBC tanks which contains oil and cutting fluid waste, being loaded for processing by a specialist contractor. EU legislation introduced in 2005 aligned us with the EC Hazardous Waste Directive, making many companies like us hazardous waste producers for the first time. Veolia not only collect our waste, but deal with our site registration and all relevant paperwork. The Isle of Wight Music Festival had another successful year, with many popular artists keeping the crowds up beat. Rod Stewart bought his spectacular live show to the festival for the first time, performing a set of both classics and new hits in his dazzling signature style. Several of the CSC Team attend the festival most years, which of course is always made extra special when the weather is good as in “dry”. Next year’s dates are already out there (21-24 June 2018) and the plans having already begun.